Definition: The frequency is the number of oscillation per unit time. It is used for defining the cyclic process like rotation, oscillation, wave etc. The completion of the cyclic process at particular interval of time is known as the frequency. The SI unit of the frequency is Hertz. The symbol λ represents it. The one hertz means the wave completed one cycle in one second. The traditional unit for measuring the cyclic process is revolution per second which is equal to one hertz. 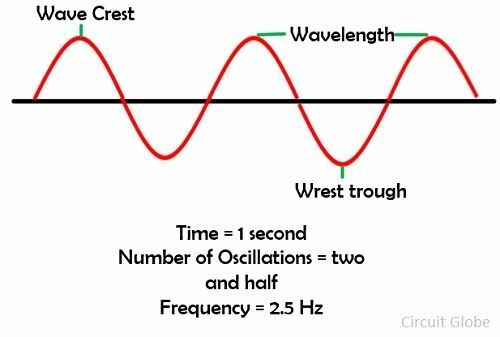 The frequency is the parameter which explains the phenomenon of oscillatory and vibration like the mechanical vibration, sound signals, light, frequency waves etc. The term “period” represents the time required by the wave for one oscillation, i.e., it is inversely proportional to the frequency. Frequency is the total number of oscillations per unit time. If we take the example of the flashes, then the period is the time between the two flashes. And the frequency is the total number of flashes per second. The wave is a kind of disturbance used for transferring the information. The information is transferred in the form of the oscillations. The wave period and the wave frequency are the two phenomena of the oscillations. 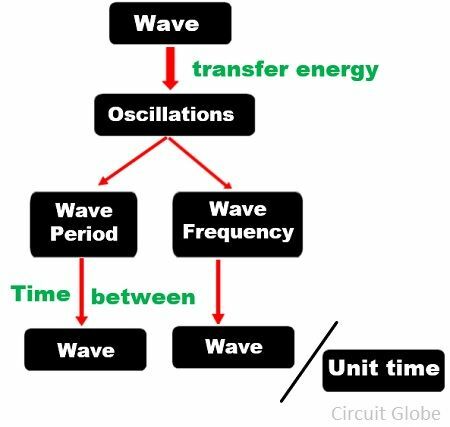 The wave period is the difference between the wave and the wave frequency is the number of waves per units time. The frequency is mainly classified into two categories. 2. Spatial Frequency – The frequency which depends on the spatial coordinate is known as the spatial frequency. It is inversely proportional to the wavelength. The spatial frequency measures the characteristic of the structure that is periodic in space.